It doesn’t matter if playing guitar is your job or your hobby; it’s always nice to have a “guitar for the road,” so to speak. An instrument that you can pull out at a campfire, a family jamm session or on a bumpy tour bus. Basically any sort of situation that you wouldn’t want to risk any of your primary instruments in. But the problem with most guitars that are affordable enough to be considered as “add-ons” to your instrument collection is that they don’t sound that great. Well, Fender seems to have come up with a legitimate solution to this problem with their Classic Design series which features a range of affordable guitars that blend simplicity and Fender’s high design and build quality. Today we take a look at the CD-60 dreadnought guitar which also comes in a concert electric variant. Despite the CD-60’s $200 price-point, it doesn’t look or feel like a cheap instrument by any means. The guitar features a laminated spruce top, laminated mahogany back and sides and a rosewood fingerboard. The guitar also comes complete with scalloped X bracing, dual-action truss rod and doesn’t have any of the minor defects such as stiff tuning machines or wonky bridge pins that usually plague most guitars in this price range. The CD-60 comes in black, natural and sunburst finishes, and while it won’t really turn any heads with its looks, it’s a simple but elegant guitar in its own right. The Fender CD-60 comes in a large variety of colours and body types. The colours available include natural, black, sunburst, mahogany and cherry burst. 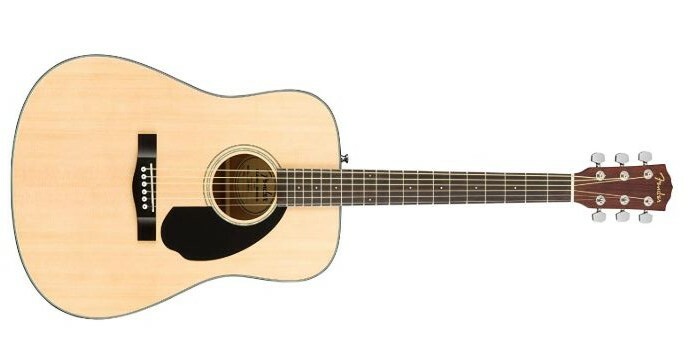 The CD-60 is not only available in the traditional acoustic dreadnought body shape, it is also available in a cutaway body with electrics, as well as a folk body (CF-60) and a folk cutaway body (CF-60CE). Check out the table below to see what's available. "The CD-60S is one of our most popular models and is ideal for players looking for a high-quality affordable dreadnought with great tone and excellent playability. 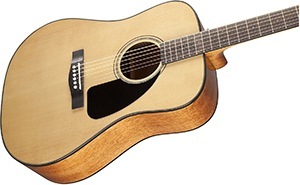 With its quality solid spruce top, easy-to-play neck with rolled fingerboard and mahogany back and sides, the CD60-S is perfect for the couch, the campfire or the coffeehouse—anywhere you want classic Fender playability and sound." Although you won’t get a concert-grade sound out of the CD-60, it’s definitely one of the better sounding guitars in its price range. The guitar’s dreadnought shape along with its laminate body offers a deep and fairly rich tone, especially when strummed. The action on the guitar is pretty comfortable too which doesn’t make lead playing a nightmare as with most lower-end acoustics. However, the CD-60 does fall short in terms of sound when finger-picked because it lacks the clarity and definition of individual notes that higher quality guitars produce. 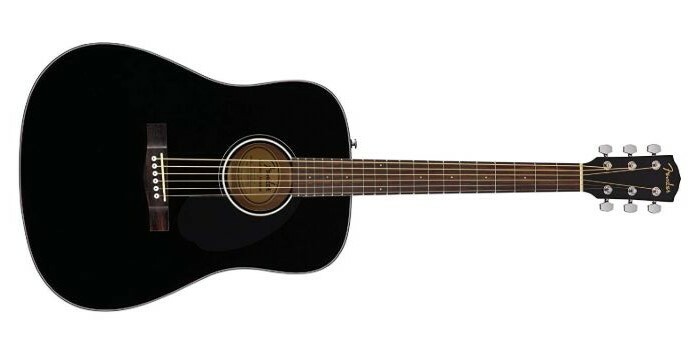 The CD-60 also comes in an acoustic electric variant which can be tweaked once plugged in for a more personalized sound. The CD-60 might be on the lower end of Fender’s product spectrum but it definitely feels like a guitar that’s made to last. The guitar’s polyurethane gloss finish is surprisingly tough and doesn’t yield as easily as you’d expect to minor bumps and scratches. And what’s really great is that Fender throws in a hard-shell case at no extra cost when you buy the instrument in North America. This really is an amazing value proposition considering that you’d usually expect to spend in excess of $60 for a good hard-shell case. Whether you are a beginner guitarist still feeling your way around the instrument or a seasoned professional on the lookout for a backup guitar, the Fender CD-60 certainly offers a great deal of value for money. And with a good setup job and a set of high quality strings, it can actually start to sound pretty great with time.